The Russian culture minister said ‘Child 44′ painted the population as “sub-human”. 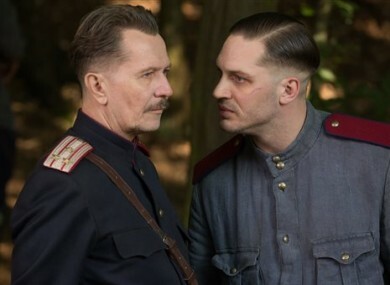 RUSSIA HAS BANNED the latest Hollywood movie, starring Tom Hardy and Gary Oldman, that goes on general release in Ireland today. “Child 44,” directed by Daniel Espinosa, is a mystery thriller featuring a Soviet policeman investigating a series of grisly child murders in 1953. The ministry and the distributor, Central Partnership, decided that it would be “inadmissible” to release the movie in Russia in the run-up to celebrations marking the 70th anniversary of the victory over Nazi Germany, the ministry’s statement said. He was alluding to the land of evil in J. R. R. Tolkien’s The Lord of the Rings. “That is how our country is shown, the country that has just won a great war, become a global leader and was close to launching the first human into space,” Medinsky said in a statement. Email “Russia bans Tom Hardy movie as it casts the country as 'a sort of Mordor'”. Feedback on “Russia bans Tom Hardy movie as it casts the country as 'a sort of Mordor'”.